On a rainy day earlier this week, Harper and I got out the glitter and jazzed up some little pumpkins that we had just picked up. It was a fun and easy craft to do with her and we now have a super sparkly floor! There are only a few materials needed: pumpkins (any size or shape), glue, glitter, paintbrushes and wax paper. 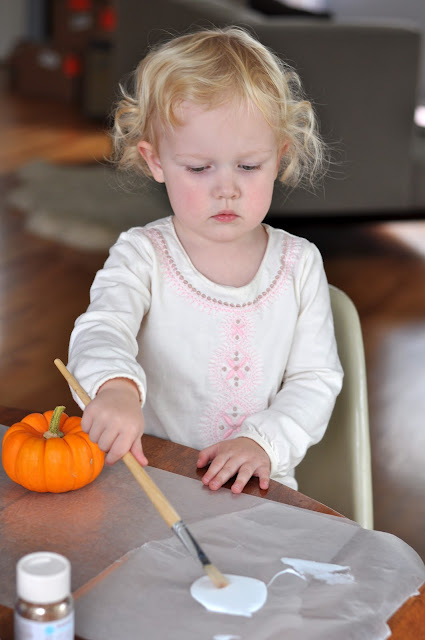 After spreading out the wax paper, start applying glue to half of your pumpkin. Only do half because your glue will dry and it will be much less messy. 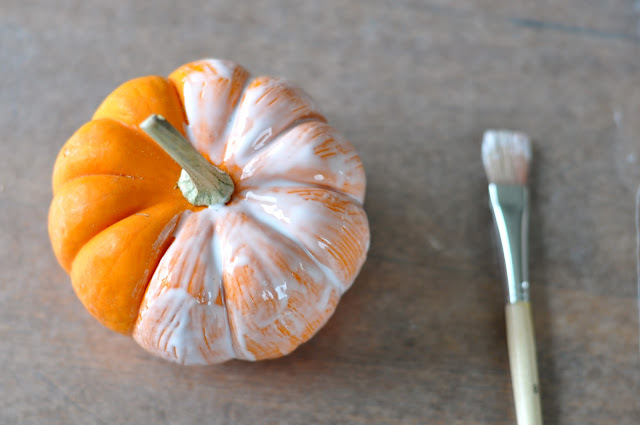 Once you have painted half of your pumpkin with glue, start sprinkling with the glitter. Allow the pumpkin to dry completely before repeating the process on the other side. After the pumpkin is completely glittered, let dry overnight before handling. Enjoy! When I was teaching, I glittered a huge pumpkin with a jack o' lantern face for our fall carnival raffle. Harper is going to make one for her teachers at school for Halloween and we are keeping the rest on our table at home. these are so cute! I love the candy corn tablecloth, by the way! great teacher gift! going to have to steal it.